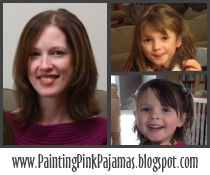 Painting Pink Pajamas: "Yes, we have no bananas..." Actually, we have TONS! Help! I always make banana bread with mine, but you already have that covered. All I can think of is smoothies. My hubby makes great banana-oatmeal waffles. Google for a recipe. You could do muffins! I suggest adding chocolate chips for a special treat! You are due May 3? That's only 4 days after my due date! (hee hee). And I haven't gotten anything really done for the baby either. I've got fabric for blankets to make, and my mom is refinishing the cradle heirloom we have, but I don't have another bedroom in my house for the little one, so he/she will be sharing with us until old enough to move in with his/her sister. If that room is big enough. Otherwise we'll have some major renovation projects on our hands! Funny how much more planning we do with the first than the second, isn't it?